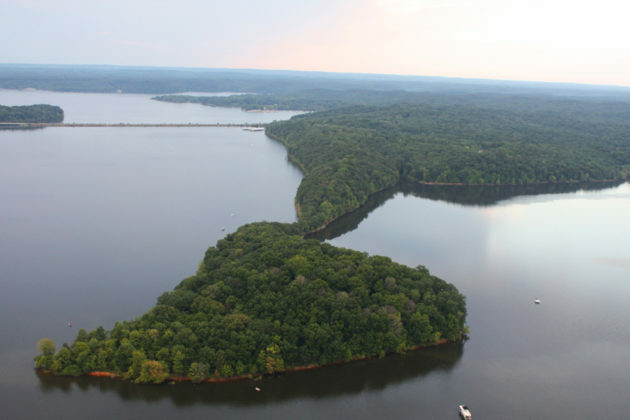 Peninsula on Lake Monroe becomes Sycamore’s newest nature preserve. We have the great pleasure of protecting forever an exceptional new nature preserve, the Amy Weingartner Branigin Peninsula Preserve. Situated on 48 acres with a unique ridge extending three-quarters of a mile into Lake Monroe, the property abuts 1.7 miles of shoreline and features good-quality upland hardwood forest along with interesting geology. This preserve provides enormous benefits for plants, wildlife, and water. The forest cover protects the steep slopes from eroding into the lake, and provides habitat for all kinds of migratory songbirds and other wildlife. It contributes to the large forest block in our region that is so important to migratory songbirds. On a recent visit there, I saw a bald eagle flying among the treetops, as well as several hawks and woodpeckers. Spring wildflowers are abundant on the forest floor. The preserve is crossed by the Mt. Carmel Fault, so that younger limestone is exposed on the east side while older sandstone caps the western ridgetops. An old quarry site cuts into the side of a ridge, where rock was removed many decades ago. Another remarkable features of this preserve is the glorious vista it offers along a 1.1-mile trail, 2.2 miles out and back. From the first section of the trail, which was built by the Hoosier Hikers Council, to the wide old road which comprises most of the trail, visitors will enjoy towering trees and panoramic views of the lake. Follow the trail all the way down to the water, where geodes and shells are abundant in the sand. But please remember the first rule of the outdoors: take nothing but memories and leave nothing but footprints. This preserve would not have been possible without the generosity of many people: Larry and Carol Weingartner, John and Eric Branigin, Tom Seeber, Mike Jarvis, Loren Wood Builders, the Bicentennial Nature Trust, the Community Foundation of Bloomington and Monroe County, and Sycamore members. This unique preserve was named after Amy Weingartner Branigin. Amy was a lover of nature, especially the less popular critters like bats, bugs, and snakes. “If there was an animal that was getting a bad rap, that was the animal she took under her wing,” explains Carol Weingartner, Amy’s mother. 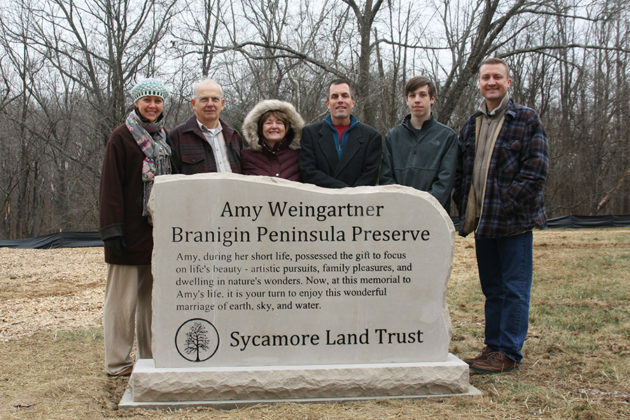 The Weingartners and Branigins stand with Sycamore staff by the nature preserve’s limestone monument donated by Indiana Limestone Fabricators. Amy passed away in 2012 of a brain tumor at age 49, and her family knew they wanted to memorialize her in nature. Carol and Larry approached Sycamore Land Trust. Christian Freitag and John Lawrence, Sycamore’s Executive and Assistant Directors, looked far and wide for caves to protect, protect, because caves were near to Amy’s heart, but nothing quite fit. Then one day, Christian showed the Weingartners the peninsula, on the site of the former Shawnee Bluffs camp owned by the IU Alumni Association. The entire camp had been sold for development, but the peninsula was still free of new construction. They all knew the site would be a fitting tribute to Amy’s legacy as a protector of nature. Most of the property was purchased in 2015, and two more important parcels acquired in early 2016. After careful planning, trail building, and parking lot construction, the Amy Weingartner Branigin Peninsula Preserve opened in late 2016. When asked what Amy would say about all this, Carol suggests that she would be proud but a bit overwhelmed by all the attention. Amy was friendly to every person and animal she met, but remained reserved and humble. John Branigin, Amy’s widower, also shies away from the limelight. He gives Amy all the credit for raising their son Eric, now 16, to be the avid reader and nature enthusiast that he is. But it’s clear that the entire family embodies Amy’s upbeat, generous spirit. Parking is very limited, with only 7 spots and one ADA accessible spot. Please carpool and try to visit at off-peak times, like weekdays. There is no street parking allowed. If the parking lot is full, visitors can come back later or try out the great hikes at nearby Pate Hollow Trail, just up the road on 446 at Paynetown SRA. Part of the trail gets muddy after a rainfall, so be sure to wear sturdy shoes.